Does motion control help us feel like we’re “in” a game’s world? A few weeks ago I published an article on presence and video games, discussing a model of what puts us in the curious psychological state of feeling like we’re in a game world. When we experience presence we ignore the technology between us and that world, and we’re more likely to enjoy the game and more quickly able to learn its rules. I hypothesized at the time that motion controls that more closely mimic real movements are more likely to create presence, but that the research still had some ground to cover. I continued to read about the topic and given the recent release of Playstation Move and the imminent release of Kinect for the Xbox 360 I thought it would be a good time to revisit the relationship between motion control and presence. Topical! Besides the fact that absent or extremely simplified controls give us a lot less technology to forget about on our way to presence in the first place, the other reason to think that motion controlled games can create more presence has to do with mental models. In the context of video games, mental models are the representations we build of a game world –how the space is arranged, what its characteristics are, what the hell that thing is, what’s the deal with all the screaming when I press this lever, and so forth. One could hypothesize that more natural game controls help players more easily build and access those mental models by allowing us to take information from the real world (“I’m swinging a bat!”) and immediately understand what that action means for things in the game (“My little dude is swinging a bat in the same way!”). This creates consistency between things 1 in game and what we know about their real life counterparts –and that’s just the kind of thing that has been shown to create presence. Directional natural mappings are the least natural, represenging simple up/down/left/right mappings and maybe some buttons. Think Street Fighter 4: up to jump, left/right to move, down to crouch, and buttons to punch or kick. Kinesic natural mappings are those that involve gross body movements 4 to control the game without holding a controller. This is pretty much every Kinect game, plus some of Sony’s EyeToy games. Incomplete tangible natural mapping gives players something that feels like an in-game object. Wii Sports, for example, uses this kind of mapping when it asks you to use the wiimote like a tennis racket or golf club. A lot of Playstation Move controls are going to fit in here, too, like the ping pong game or the archery game in Sports Champions. Realistic tangible natural mapping, though, is the most realistic kind of controller. This gives you a thing that is a thing and behaves like the thing in the game …thing. 5 Steering wheels for racing games fall into this category, as do drum sets for Rock Band or Guitar Hero –not to mention that nutso stringed guitar controller that Mad Catz wants you to buy for Rock Band 3. Flailing around like a nincompoop really makes me feel like I'm flailing around like a nincompoop IN THE GAME! Skalski et al. were interested in whether more natural mapping of controls would lead to greater self-reports of presence while playing games, so they ran two experiments. In the first, they had one group play Tiger Woods PGA Tour 07 on the Nintendo Wii using the wiimote like, appropriately enough, a golf club. Another group played the Playstation 2 version of that same game using the dual shock controller. The results were that the wiimote did indeed feel more natural, as measured by questions like “The actions used to interact with the game environment were similar to the actions that would be used to do the same thing in the real world.” No surprise there, but they also found that use of such controls did correlate with spatial presence (“To what extent did you experience a sense of ‘being there’ inside the environment?”) and people who played the game on the Wii were more likely to report experiencing presence than those who played with the PS2 controller. This all suggests that if the goal of your game is to make players feel like they’re part of a game world, motion controllers are better than traditional game pads or keyboards. 6 Of course, not all games have presence as a design goal, not all games can be controlled with motion, (imagine trying to play Starcraft II with just motion control) and there are probably other characteristics of motion control (like exhausting or uncomfortable movements) that could detract from the overall enjoyment of a game. Again, this is an area rife with possibilities for research …things. 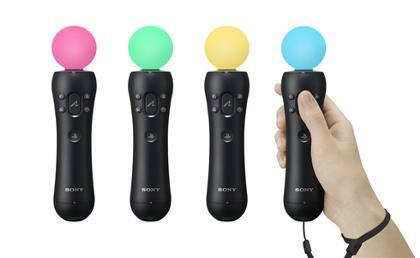 Anyway, has anyone played around with the Playstation Move yet? Does it make you more likely to forget that the game you’re playing is mediated by technology? 1. “Things” is a technical term you can never over use. Go on, just try to over use it. You can’t! 2. Skalski, P., Tamborini, R., Shelton, A., Buncher, M. & Lindmark, P. (2010). Mapping the road to fun: natural video game controllers, presence, and game enjoyment. New Media & Society. 3. Big thanks, by the way, to Paul Skalski for talking to me about his research and forwarding me this paper. 4. Pun intended? Yes, pun intended. 5. I’m telling you, can’t be over used! 6. Though I should note that Skalski et al. never tested a “kinesic natural mapping” a la Microsoft’s Kinect or a pure EyeToy game. Someone should do that. I have a weird kind of question about these findings. The question and answer nature of the study seems to belie a version of the “uncanny valley,” if you will. * Swinging a golf club is like swinging a golf club. We get that. * Swinging a Wiimote is more like swinging a golf club than pressing a button. * Pressing a button is a nearly pure abstraction of the movement. Well, swinging anything in any direction could be *verbally* construed as being more natural, especially if the question construed it as being similar — like using the phrasing “swing” in both questions. I think the study would show different results if it didn’t involve self-reporting, was tested over a longer period of time more akin to a real gaming sessions, and we could somwehow measure engagement via another means. Let’s say the videogame was “Mario Pats His Head,” and the action to pat Mario’s head was to take the Wiimote and swing it in a wide circle. That’s nothing like patting a head. But it involves real movement, unlike pressing a button. Is this more “natural?” The previous study would indicate you would likely say yes, but clearly, the actual action would be nothing like patting your head. Using a Wiimote is not a real golf swing. In fact, it’s only marginally closer to “natural” than the button simply because it involves a gross motor movement. And I assert that marginal advancement drops you into the uncanny valley, where you end up with the comic scene of a person sitting on a couch “playing golf” without even standing up, merely because he’s mastered the use of the accelerometer. The level of abstraction between button-pressing and flicking a Wiimote to trigger the accelerometer is meaningless in the uncanny valley. Frank, you’re probably right on at least some of those points. Almost any study would be made better by being longitudinal and using behavioral measures. Also, that stuff about performing actions that don’t correspond to real movements (a la your Mario Pats his Head example) is one of the things missing from the taxonomy as I mentioned above. Why are they more “natural?” Is there anyway to prove the value of what they are assuming as given? My experience is a controller has felt tons more “natural,” to me due to it’s familiarity and training with it. Part of the reason is the response from the game is what I expect. There is a noticeable delay and awkwardness with the Wii. I’ve heard this is true with the wands, and it certainly looks that way from the videos I’ve seen of Kinect. This doesn’t mean I’m anti-remote. I think we’ll discover game play that is greatly facilitated by remotes. Like spell casting. If I could draw runes in the air similar to Ni No Kuni does on the touchpad of the DS, to do my Biotic actions, in Mass Effect 3, I would be ecstatic. I’m not sure I would describe gesticulating patterns as more natural. I think it looks more natural, because the games that have been designed so far are more towards toy than game. I also if they are actually using the fullness of the analog data they take in or if they’re just struggling to take it all in. I was writing up the other day what the Move felt like, especially as I had sort of boxed it in with the wiimote and hence ignored it more in favour of Kinect. There are various pieces of feedback that help with the immersion into the games. Using the Move to play Tumble the block stacking game the reaching into the screen, delicate twist and turns and the rumble feedback as blocks touch, combined with the audio and video does make you forget the controller a little. In games where an AR component comes into play such as Eye Pet or Start the Party it is difficult not to be fascinated by seeing the move controller disappear on screen and be replaced by a 3d tool. The magic mirror effect then seems to be quite immersive too. I tried the more physical sports games, throwing a frisbee sort of works, but the full physical interaction of the gladiator fighting using 2 move controllers one for the shield and one for the sword worked at a different level. Having no real force feedback it felt a little imagination was at work, but when you feel the urge to hold the sword aloft after smiting your enemy, a physical expression directly related to the game you are playing rather than taking your hands off a controller and raising a jubilant fist into the air with a regular joypad fighting game it seems to have dragged you in more. I end up holding things like the Wii and Move to higher standards, so they are often MORE jarring in terms of sucking me into the world. Meaning, if you’re going to give me a bat like object and then tell me to hit that ball I see on the screen coming my way, it had better work. Not someties, not even most of the time. It needs to work 99% of the time or I just start to feel like I’m playing with a really dumb controller and the problem becomes the controller, not the game. The disconnect muct be horrible, from thinking “I am going to play a game” to suddenly realising “I was in a game”. I think I’ll stick to a reality connection. Has nobody criticised the ridiculous choice of games used to demonstrate this supposed imemrsion? Of course when the game requires you to swing a stick or turn a wheel it’s easily replicated in motion, but since 90% of games have a design that is far more complex (virtually any action game or RPG) this study is, to be honest, a little irrelevant. Although I found the aforementioned very interesting to read, I think the immersion being referred to in this article is a type that is very short lived. As Frank mentioned, if the type of movement made does not correlate with the in game movement, then it adds little value to the experience. It becomes an abstraction just as pushing a button is an abstraction. Additionally, Jamie posted that the type of game being tested is incredibly simplistic. The vast majority of games are too complex to be captured by motion controls. Stats collected pertaining to console/PC usage and gameplay hours have demonstrated that the immersive level of motion controls have, up until now, not translated into longer play time. I don’t have the link for this any more, but I believe these stats can be found on Gamasutra and Gamespot. It will be interesting to see if Move or Kinetic change these stats at all. I have many reservations and sincerely doubt they will. However, technology such as Kinetic might be better viewed in light of what it is directing us towards, not what it is currently capable of. Just think about all the technologies which have come out of Star Trek and you will understand where I’m going with this. Regardless, for the time being, I believe that more longitudinal studies will bear out the aforementioned stats, especially if they track actual free choice gameplay as although self-reporting during a forced session sheds light on immersion, free choice to play evidences emersion on a different level. This blog has been loading slowly for me the last few days. I believed maybe it was my personal computer, but my sister visits your web site as well and she told me the same thing is happening to her. Any ideas? Guess most of us agree that when a movement made with a motion controller mimics the one in real life it’s just plain better and long as it’s well implemented, being analog as opposed to just activating a fixed action, example: a sword slash is reproduced exactly in the same direction and intensity and is not just a fixed hard coded slash. Of course as Matt pointed out, there’s some sort of Uncanny Valley in controls were the people fool the whole experience by mastering the simple technology behind them, and also latency issues are a big factor, not only in gaming but in the whole Virtual Environments research. Now there’s more to actions activated by “gestures” than just pressing buttons. These might not necessarily increase presence (or immersion in gaming terms), but they can simplify the player interaction with the game. Yes, we can argue that experienced players could prefer classic button inputs, but that is not necessarily the case for new comers. The more buttons and complicated layout a controller is, the bigger the learning curve for some people, and that’s when gestures comes in hand. Want to make Mario spin? just shake the controller instead of using L3 or whatever else. In short, motion controllers are in it’s infancy, as the whole Natural User Interface spectrum, but there are certainly good things that come with it, and right now more than just helping towards achieving added presence feeling, it can help towards the ease of use, engagement and flow. Some players will continue to prefer the efficiency of current controllers until motion controllers really get into a mature level, or maybe, it will always be like the user that uses the mouse and click tough icons (easy but slow) and the one that loves a command based interface (hard but fast). First comment on this awesome blog, thanks for you great content Jamie.